About thousands of aftershock has been occurred in Lombok, Bali and near Sumbawa since the first earthquake rocked the island on July 29. It has taken people into a very frightening situation and caused damaged in some areas. The first 6.4 magnitude earthquake on July at 06.47 am shook the northeast of the island and caused landslide in Mount Rinjani. Hundreds of climbers are trapped and forced local government to evacuate them. It also damaged hundreds of houses in Sembalun village and some areas in East Lombok. Hundreds of people are injured and 16 people dead. That was the first earthquake. 30 Days After Lombok Earthquake. A week after the first quake, 7.0 magnitude earthquake rocked the island for the second time on August 5 at 19.47 pm and even caused more damaged and victims in North Lombok, West Lombok, East Lombok, and Mataram. Thousands more of people are forced to leave their houses and built tents outdoor to avoid risks of being stricken by ruined buildings. National Climatology and Geophysics Agency issued the early tsunami warning for 20 minutes and then revoked it. It caused panic throughout the island. People left outside their houses and avoid the nearest coasts to avoid any possibilities of a tsunami. The quake did not end. The most recent shocking earthquake occurred again on August 19 at 22.57 pm with 6.9 magnitudes followed by total blackout throughout the island. National Climatology and Geophysics Agency have noted around thousands of aftershocks occurred in Lombok since July 29. The non-stop aftershocks that occurred have taken the situation to another level. People are frightened with many hoaxes and fake issues. For instance, the big quake that will occur on August 26 spread through Whatsapp messages and Facebook posts. It is so bad. Lombok is calling everyone to help! After the 7.0 magnitude earthquake hits the island (08/05/2018), thousands of people are forced to leave their houses. This natural disaster has become an international concern with many bits of help and donations come to the victims. Hundreds of people dead (you can check it out on national news) and hundreds thousand others are now staying in refugee camps. According to Kompas, Lombok earthquake has taken a loss for 8.8 trillion rupiahs. It’s a big deal. Even though the big quake has damaged Lombok since 30 days ago, there are still many places remain beautiful and safe. You may think it is not safe to come to Lombok and I will say it is very wrong. Lombok is still like what it was before the earthquake. The island is raising and recovering now and is ready to be the most beautiful and safe place on earth for one more time. 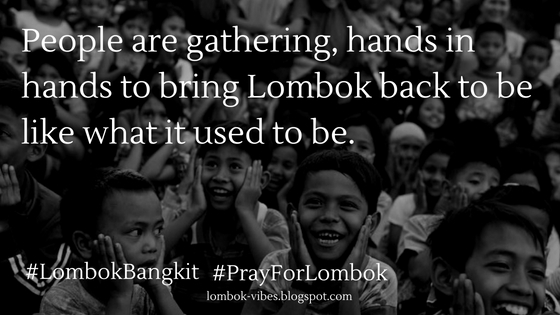 People are gathering, hands in hands to bring Lombok back to be what it used to be. Help and donations are coming from every corner of the world and thanks to those generous hearts! Lombok is now trying to get up and is ready to amaze you! 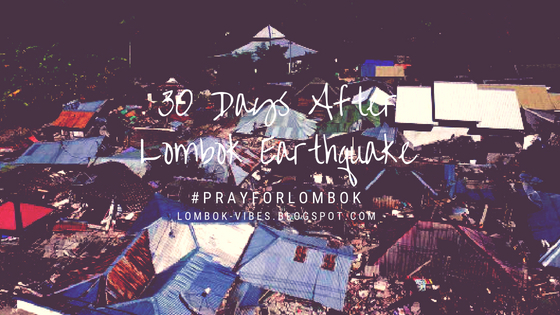 Pray for Lombok! Lombok Bangkit!